This is my favorite Christmas quilt NOT made by me. This one my Mom made before I had the quilting bug. I love the colors and the absence of novelty Christmas fabric. The pattern is the simple Amish star block. Eventually I want to copy this quilt and make one for myself! LOVE that quilt…especially the polka dots! That is darling! I love your colors! Agreed – absence of novelty xmas fabric inspiring! The stripes and dots are so graphic. A super fun quilt. How nice for you to have a quilty mom with amazing taste in fabric (do I detect stash-raiding?). What a great Christmas quilt! I love the fabrics and the funkyness of it…it is adorable!!! Ahhh…thanks for the Christmas inspiration. I have yet to ever make anything Christmas for myself (I'm great at GIVING it away!) so I'm determined to fix this next year! And suddenly I have a craving for a BIG mug of hot cocoa…. I really like it! Very cute and simple! that mug is fabulous!!! your christmas quilt is so pretty. Old Navy this year? I need to get to the mall! Oh, that really is fabulous!! You are my inspiration. Just thought I would tell ya. 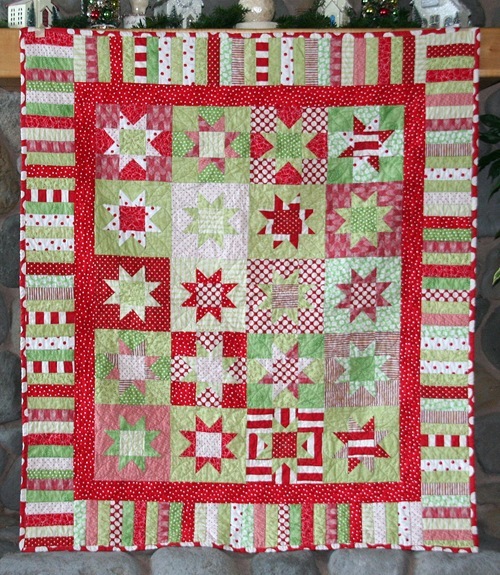 A Christmas quilt without novelty fabrics – excellent. It looks so gorgeous. Looking forward to seeing your version. That quilt is really cute! Love your mug. Awsome quilt! Your mother is talented! I wish I could do something like that and not abandond it! Haha I'm a procrastinator! Merry Christmas and Happy Holidays! I love the fabrics. Hey, maybe your mom could give it to you and then you wouldn't have to copy it! My daughter can talk me into giving her my quilts. Hmm, maybe I need to do something about that. Wow!! Now this is what I would call a true Christmas quilt!! Well done mom! What a great Christmas quilt! Unique that the green fabrics are all of the lighter shades . . . very interesting. Inspiration plus! 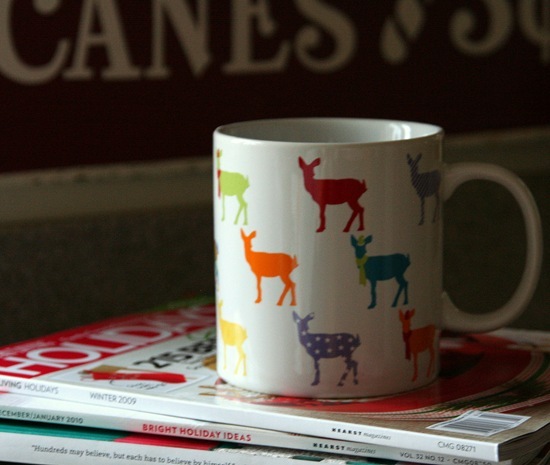 I WANT that deer mug! Matter of fact, I want a whole set of them. Our nearest Old Navy store is 130 miles away and I know I won't get there before Christmas . . . maybe I should try online? your mom did a fabulous job! i love the colors and the traditional star! Just so you know, you're my new favorite sewing/quilt blog! Every time I see your adorable quilts (or your mom's), I want to run to my sewing machine and get busy! Love love love! WOW!!! I LOVE the quilt and the mug!! Gorgeous quilt. I have yet to venture into quilting. I know, once I start, it could be trouble. Love the mug! those are all my colors love them all!!! 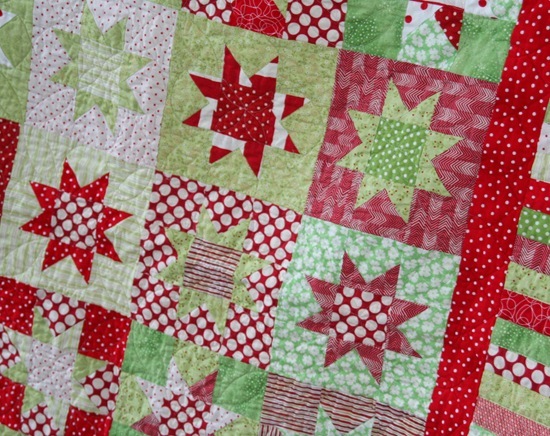 I love the Christmas quilt! I need to make one for my bed! I am the only person in Fairfield County that does not have a Christmas quilt on my bed! Love the quilt. The colors are great and the big polka dots on the binding are so whimsical! So cute! Hey allison! love all the patterns on the fabric your mom used! and i especially love the MUG! Great quilt and super great mug! This is a beautiful quilt ! I have been wanting to make one for our family and each of my boys. I am going to attempt to do so in 2010. If I get it done I'll send a photo. Beautiful holiday quilt! Love the colors.